Over the years I have seen countless watch enthusiasts pass through the ‘accumulation phase’ of watch collecting. With the intemperance of a flock of Gormands at an All You Can Eat smorgasbord, they sup greedily at the eBay buffet, stockpiling as many variants on their plates as means allow. After all, more is better, and a collection isn’t a collection without numbers, right? Wrong. 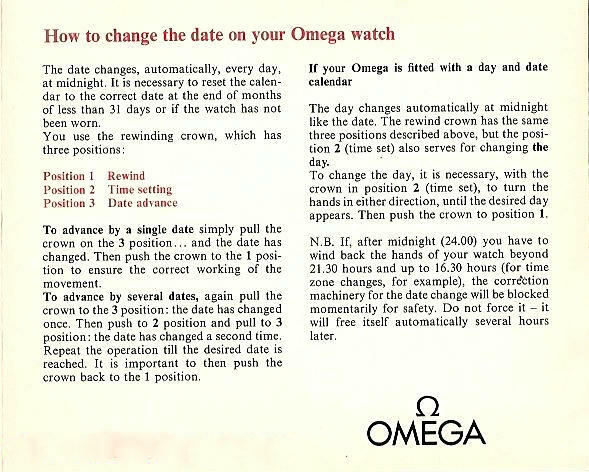 A collection can be a collection if you have more than two of something, and some of the most exquisite collections of vintage Omega Constellations I’ve seen have been in trios or quads. What makes these collections so alluring is that numbers have been substituted for quality, originality and fineness. And, from my perspective, it is a far more astute to pay the price demanded of one fine example than outlay a similar amount of money for three also-rans. 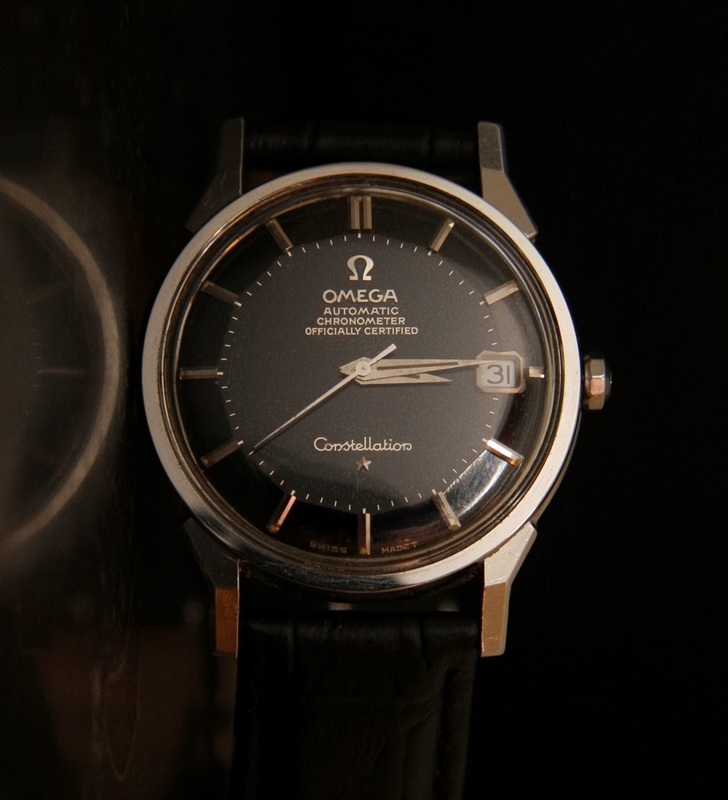 The Omega Constellation calibre 561 model 168.005 below is offered in support the “condition over quantity” argument. Feel free to use it as an exemplar of what you can aim for, should the notion of going for the best and leaving the rest appeal to you. This one good piece is indeed worth three also-rans, and will continue to appreciate in value because of its fine, genuine black dial and sharp overall condition. There is little more to be done to this piece other than to restore the hour and minute hands. The crystal is genuine and has the etched laser symbol although it can't be seen in the picture. Notice the case has seen little wear. The facets on the lugs are sharply defined and the bezel is crisp and not rounded. The case has never suffered under a watchmaker’s polishing mop and reveals its original finish. The watch retains its original decagonal crown and only the slightest patina appears on the dial. Black dials of this condition are decidedly uncommon and will become more so with the passing of time. So, before you press the button, consider scrutinising a potential purchase closely. Look for signs of excessive wear on the case; examine closely the dial for condition and to assure yourself it has not been refinished, and inspect the movement to ensure signature parts are present and the movement has not suffered under the hands of amateurs. You can burn holes in your pockets accumulating numbers, but a couple, or even a few, top shelf Omega Constellations of the condition shown in the above example means that if things get too hot there will always be eager hands ready to relieve you of your ‘burden’........ and pay you good money for the privilege. A very fine example Desmond - definitely top-tier. Unfortunately we mere mortals just do not come across such treasures, let alone have the opportunity to acquire them. We can only drool. I will have to disagree with Aroma. I would have a much larger (and worse) collection had it not been for people like Desmond and Ronnie who have been more than kind in trying to educate me on Omegas. I have read just about everything I can get my hands on (again, thanks to Desmond for all his essays). The nicest pieces I have are an Omega cartouche which Desmond spotted. an XVI with the Olympic Rings that came from Ronnie, and a really nice Centenary from Desmond. The others vary from really nice to "I'll keep it to remind myself what can happen when you buy before "learning what you are buying". The watches I bought after getting advice from people more knowledgeable than myself (not hard to do that early on) are the ones I treasure. If you keep looking, learn, and remember to be humble enough to ask people, you will acquire really nice pieces and avoid the products of Dr. Frankenwatch. In real estate "location" is everything". With watches "condition" is everything. I have not regretted one bit letting some of my "finds" go unpurchased when their flaws were pointed out to me. As a result, I still find some stinkers, but now I know they are stinkers. The nice ones are increasingly rare because my level of scrutiny is higher. Thanks again Desmond and Ronnie. Thanks Desmond. That case can seriously slice a tomato. I am going to save that picture for future reference. Desmond. How much do you think is a reasonable price for this example you have shown us? Yes, too many dealers using me as a resource to verify their stock and then not even saying thank you, so I've stopped communicating. Feel free to post your email. I wont publish it and will respond privately to you.